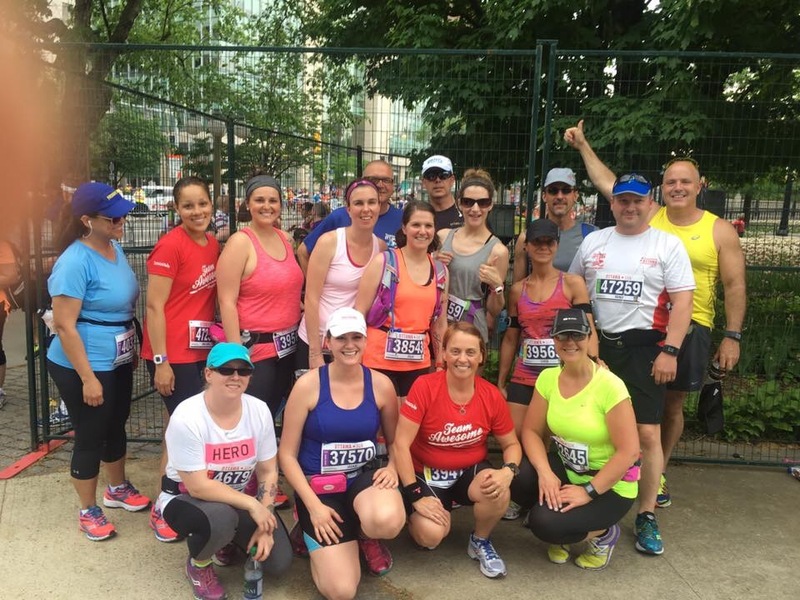 ottawa race weekend – Pump Those Crazy Legs! 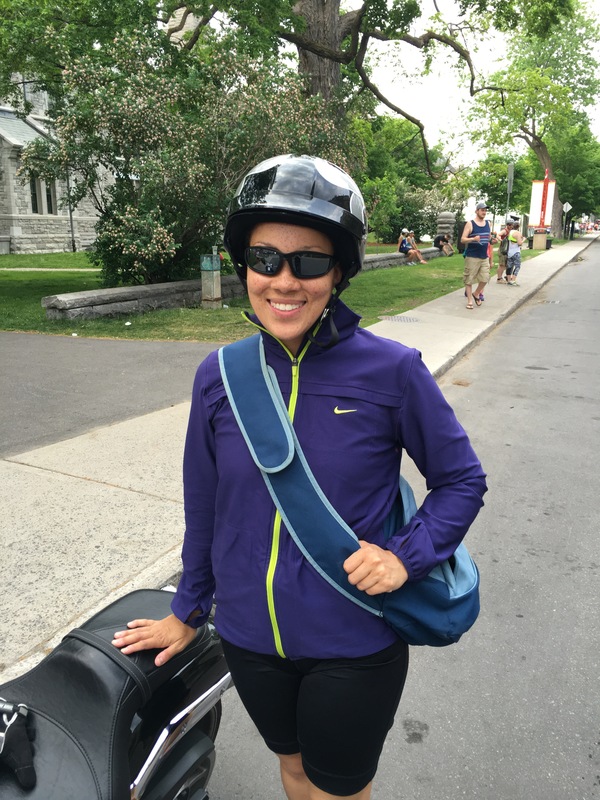 On August 20th, 2015 I signed up for my first race of 2016: Tamarack Ottawa Race Weekend. I was told it was the biggest and most eagerly anticipated race of the year! 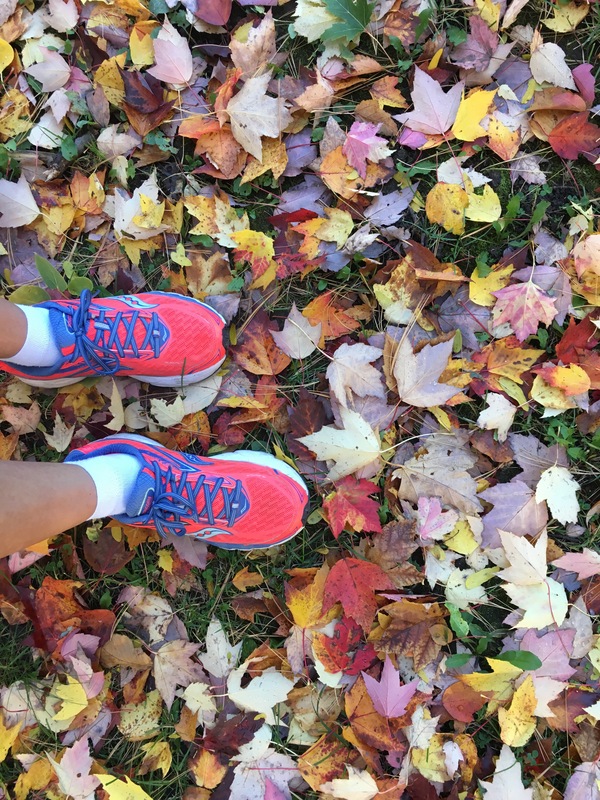 The colder weather was coming and I knew I needed something to keep me motivated to continue training through the long winter months ahead. This race was going to be it! 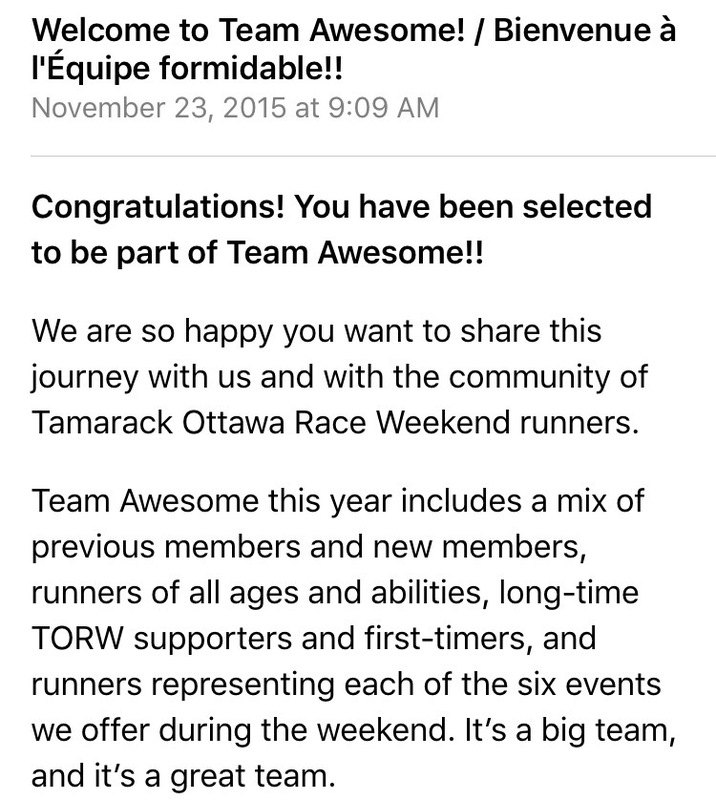 In addition, in November I also applied to become a member of Run Ottawa’s Team Awesome. This was something I had only just caught wind of from my Twitter feed, right on the last day they were taking submissions! 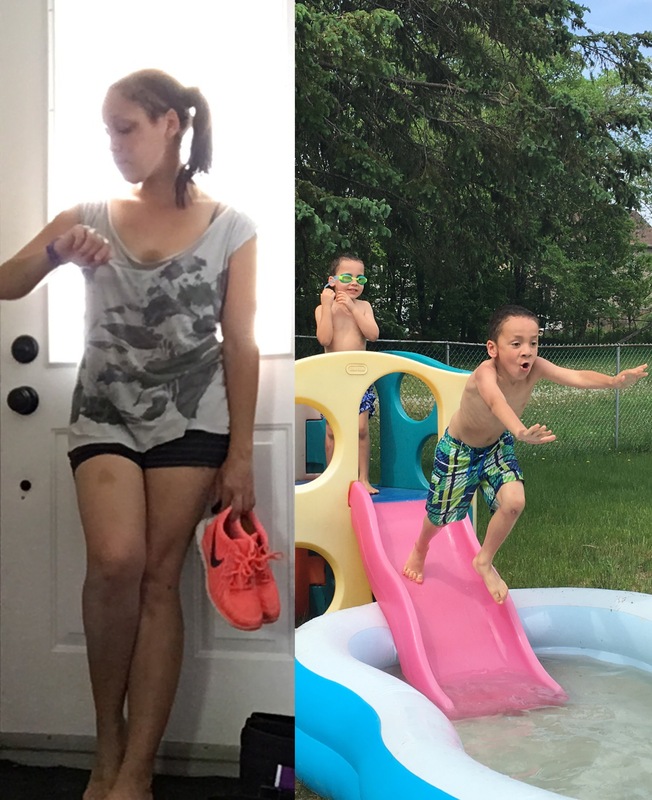 So I quickly typed up my responses and sent them in, just on the off-chance that they could use a newbie runner like me as an ambassador for Race Weekend. Man, was I ever shocked when I got the email back telling me that I had been chosen to be part of Team Awesome! I even ended up joining a 10k clinic at the Running Room in March. Initially it was in the hopes of improving my 5k times, but I enjoyed running the greater distances so much that I soon decided to upgrade to 10k as my new course distance for Race Weekend! 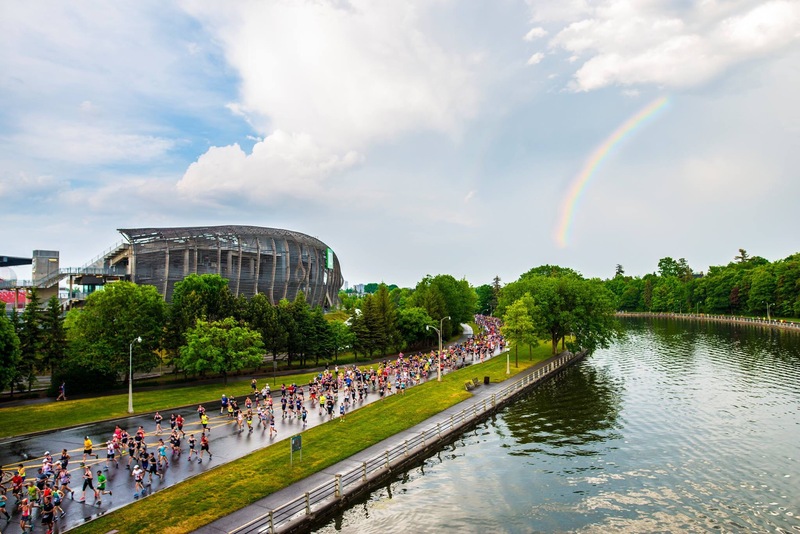 Fast forward to May 28th, and after weeks of cold weather we found ourselves in the midst of a typical Ottawa spring-to-summer transition, smack-dab in the middle of a 40°C (104°F) heatwave. 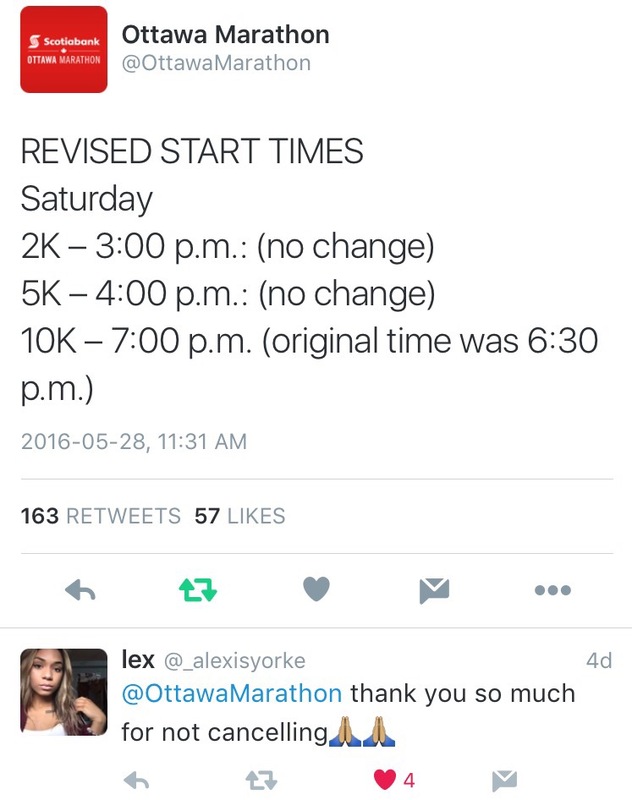 The 10k was slated to begin at 6:30pm, which allowed me the opportunity to sleep in and have a relaxed day at home. I was feeling a bit antsy as I waited, so instead of standing anxiously by the front door I decided to help set up the pool for the kids to splash around in. However, due to the extreme weather conditions, the starting time of the race ended up being pushed half and hour later into the evening when it would hopefully be a bit cooler out. 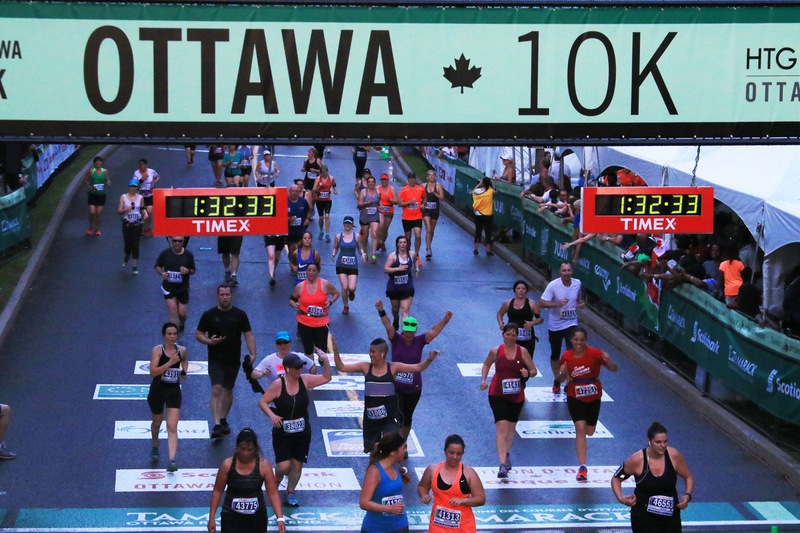 There was a lot of concern surrounding race weekend as this was not only the first real heat here in Ottawa since last September, but also that all of our training beforehand had taken place during cold conditions! 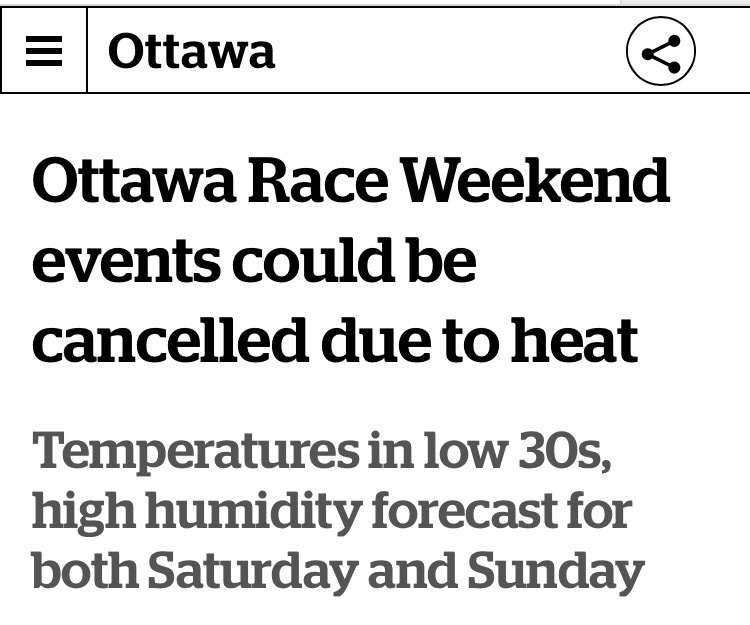 There was talk of cancelling the races altogether, but thankfully shifting the start times to cooler parts of the day (plus all the community rallying together to provide plenty of water to drink and for the cooling stations) saved the day! I brought my mum over to help watch the boys and Paul took me – in all my running gear – on the back of his motorcycle into town. There were a lot of road closures and traffic so we figured the motorcycle would make it easier to navigate through everything. He was easily able to pull over by a sidewalk behind City Hall where everyone was congregating to let me off. I got there in good time, contrary to my habit of always arriving late. My first stop was to meet up with my Running Room group by the eagle statue at Confederation Park (I had to Google it beforehand) for a group photo. I began to feel a little anxious as I was the only one carrying a bag that still needed to be checked into the baggage check. Once I had found my group I realized that I didn’t want to lose them again! As we headed to our corral we were reunited with a few more members from our clinic again. We stood together chatting while we waited to be unleashed upon the race course. It was during this time that the dark clouds overhead released a brief but torrential downpour and we were utterly drenched! By the time we started running it had stopped, but my shoes were so full of water that they were ‘squelching’ with every step. Plus, the heat and humidity remained so I continued to be a soggy mess for the rest of the evening, haha. The four of us decided to stick together as we ran, as we had trained together and were all about the same pace anyway. 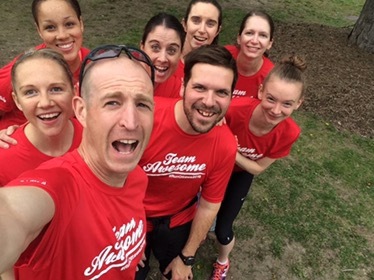 One thing we discovered during run club is that it is so much more enjoyable to run with friends! As we passed by the 1 kilometre marker I heard an eruption of applause and looked over to my left to see the elite 10k runners already headed for the finish line! 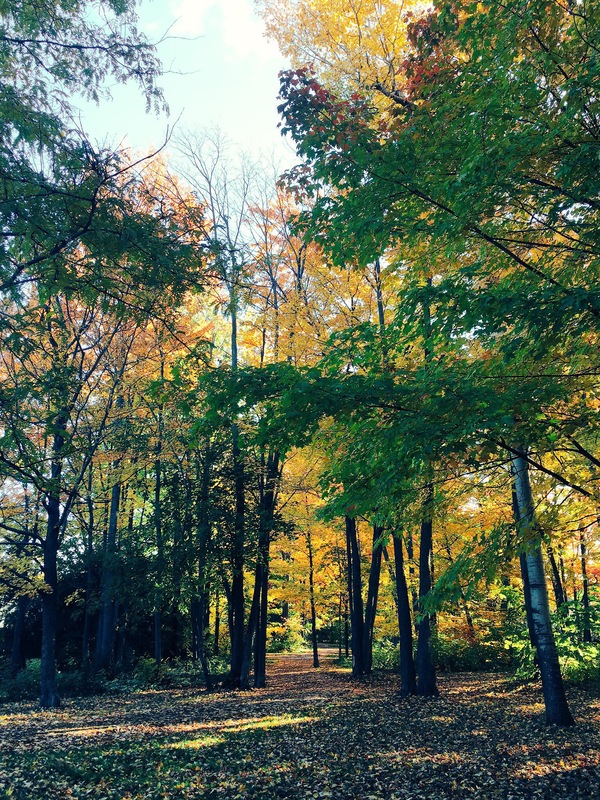 My jaw dropped and I had to shake myself back into focusing on my run. It was so amazing to see them that I just wanted to stop, watch, and take a few photos!! We continued on as a group, through streets lined with cheering crowds. People spraying water at us to help keep us cool (I’m already soaked tho). People playing music and holding up the most amazing signs to help motivate the runners. I had almost finished off one of the two water bottles I carried on my belt by the time we reached the first water station, so I made sure to go over and grab a cup! It was cool and refreshing and just what I needed. We also ended up making a quick stop at the bathrooms, but luckily there weren’t too many people in line at the first set of porta-potties. It was at this time I decided against just continuing on without my group because I felt it was more important for us to stick together. 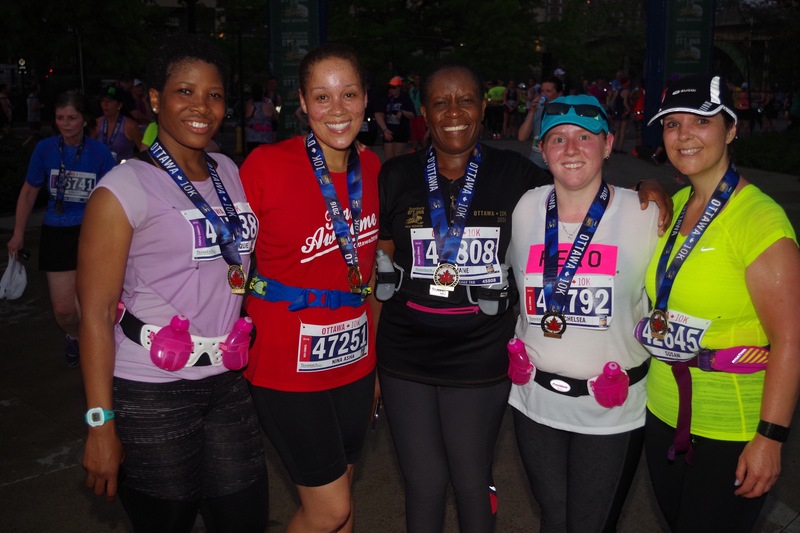 Plus, it was just so crowded out there on the course (we were constantly trying to weave our way around people) and I had serious doubts that I could achieve a PR on this race anyway. Instead, I opted to enjoy the company of friends and make this an experience to remember. We took selfies while we waited, and within 3 minutes we were back on the course! Our legs stronger and faster too thanks to the little break! The course was beautiful, along the Ottawa River with the sun setting in the horizon. At one point a rainbow even appeared in the sky! Towards the end, the other ladies in our little group started to feel it and pulled back a little. That’s when Chelsea and I decided to push forward together in an effort to get this hot run over with, lol! 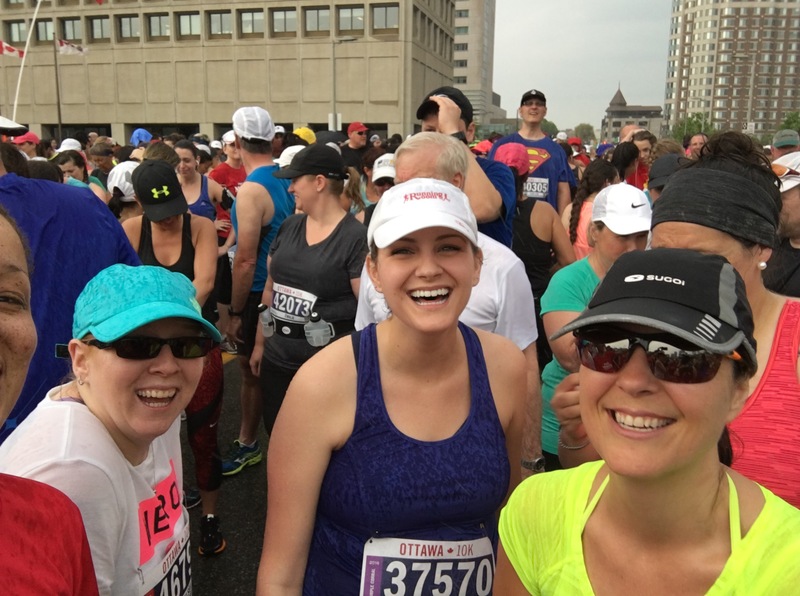 We stopped pacing ourselves and just went for it; weaving our way through the other runners. As we hit the last 400m I was pretty sure I was either going to pass out cold or vomit everywhere, but I could see the finish line and kept pushing on! What a surprise it was for me to see my husband in the crowds during those last few metres as well! He had no idea when exactly I’d finish and had just arrived when he caught a glimpse of me coming down the course! He called out to me and I waved, so excited to see him as I continued powering my way to the finish line! It really meant a lot to me to have him there for that moment. Chelsea and I ended up finishing the 10k in 1 hour and 16 minutes! Not my fastest 10k but definitely my most enjoyable!!! We waited beside the finish line for the rest of our girls, who arrived within minutes of us. Then we all walked out together, where we were given water and people sprayed more mist at us, lol. Next we received our coveted 10k medals which had a spinny maple leaf in the centre! Fanciest medal ever!!! Lots of photos were taken and we picked up our bagels and bananas before reuniting with our family members on the other side. I ended up feeling pretty nauseated and dizzy for the rest of the evening, but was good as new the next day, thankfully!